It has been a while since the last post in My Bentolicious. Our has been blessed so much by God! The kids has finished their first semester last December and got excellent results for their report card. I'm very proud of them for their hard works and hope they will keep up the same efforts for the second semester too. We had a family vacation in Melbourne and Sydney in December. We spent the Christmas and the New Year there. We had a great time there! Big A almost couldn't get in because of visa matters. We never realized that she had to use Australian passport to get into the country because she was born there. Luckily, at the night when we were in the airport there was an officer from the Australian embassy. So after almost 1 hour my hubby tried to sort it out and Big A was permitted to travel this time with Indonesian passport. We met my sister and her twins. Couldn't believe that the twins are 2 years now. They are already running around and speaking. I still remembered when my last visit to Melbourne, the twins were still in the hospital because they were born premature. We also met some of our friends there. Kids were excited to see new friends. Big A and Little A even drew a happy family picture and gave it to me and my husband. God has given so much His blessings last year to us. I'm really thankful for that. I hope this year, no matter what will happen in our life … I believe God will always be with us and give our a way when we face an obstacle in our life. I hope the same for all of you too. God bless you all in this new year! New semester has started yesterday. I did make bento yesterday for the kids but didn't take any picture so I didn't blog about it. 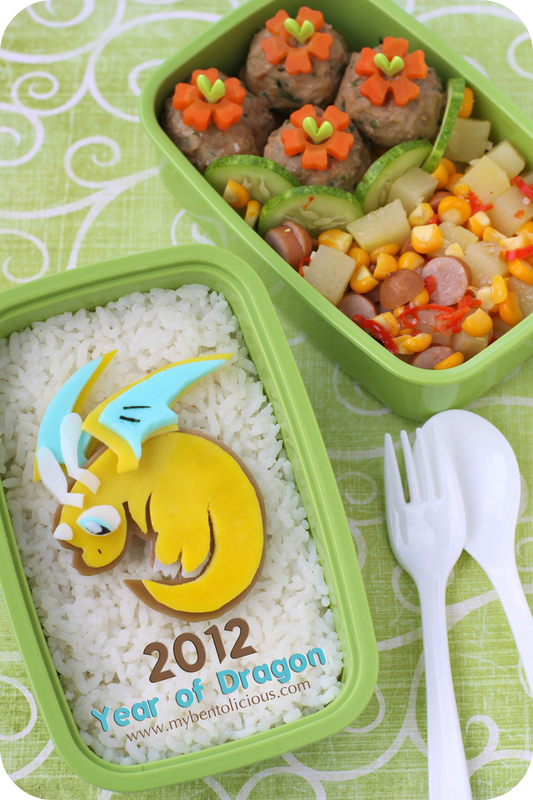 Today, I made the Dragonite bento. A character from Pokemon that my kids asked me to make last night. And I agreed because I think it's appropriate for the first post in the new year as the Chinese New Year is coming soon too on January, 23rd. This 2012 will be a dragon year. Inside the bento box : rice, steamed coriander meat ball in garlic soy sauce, fresh cucumber slices, and quick stir fry (potatoes, tiny pork sausages, corns and big red chili). What, the twins are 2 years old???!! I can't believe how fast the time flew! How precious that you were all able to spend time with them!! So happy to see you back here with bento again. I love your Dragonite character, so appropriate for the new year. Welcome back Lia! I'm so glad your family has been so blessed and I hope it lasts for years to come! Happy Year of the Dragon! I love your bento! I can never keep track of the years for some reason. ^^; And many blessings to you and your family, Lia! Yeheeee...so happy to find a new post from you, Lia.. Btw, Happy New Year to you and your family. @mama elaine : Hello Yul! Happy new year too! God bless you and your family. Send a big hug for Elaine from me okay? Welcome back, Lia and Happy New Year!! I'm so happy to see your post :D The dragon is very cute and so perfect. I love how you arranged the meatballs in the other tier. Congrats to Big A and Little A for their good marks at school and good luck to them for the New Year! I am very glad you could sort out the problem with big A passport and you all managed to fly to your wonderful vacations! The twins are 2 years old!?! Wasn't it yesterday you showed a baby picture of them? WAAH, time flies! Sweet and gorgeous dragon bento--may it be a wonderful and very happy (HAPPY!) new year for you and your beautiful family my dear! happy new year Lia! me too have been taking a too long bento break..keke..
i have dragged myself to make my first bento in 2012! yay! I can imagine how frustrating it must have been when they told you that Big A couldn't enter Oz due to her passport...! I am glad that it was solved without anyone having to go back to Indo again ;), that would be a nightmare! Hi, may i know what are the dragon made of? Cheese? Thanks.